Home / Reviews / VPN.ac Review 2016: Hot or Not? VPN.ac are encryption experts suitable for all skill ranges from the beginner to the expert. A real privacy orientated provider. PC, Mac & Android clients. If you haven’t heard of VPN.ac before this review then you won’t be alone. However, shouting from the rooftops doesn’t always mean a VPN service is any good. I’ve been testing VPN.ac over the past month to find out if this lesser known provider is a hidden gem or if it should just stay hidden. Read on in this VPN.ac Review 2016 to find out if you should sign up and if they’re actually any good. As is quite common across the VPN industry VPN.ac follow suit and offer one package that differs in price dependant on how long you subscribe for. Their pay per month package works out the most expensive and as you increase in subscription length the price gradually falls. VPN.ac offer a quarterly account valid for 3-months which is an option that isn’t available at all other providers so a nice added choice if you want more than a month service but don’t need a full 6-Month or Year package. Taking the 1-Year package is most cost effective working out as little as US$4.80 per month which is around £3.37 at today’s exchange rate. It’s worth considering the 1-Year package as that’s nearly a 50% saving over paying monthly. Every package length has access to the range of services VPN.ac offer and with a 7-day money back guarantee there is no risk in signing up as you get a full week to put them through their paces. 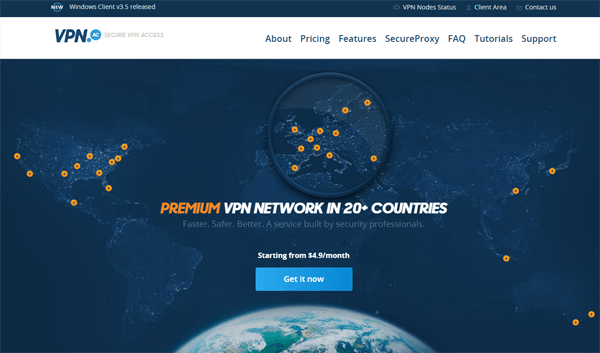 I last reviewed VPN.ac well over two years ago back in January 2014 and at the time found them to be one of the better VPN providers on the market. A lot has changed in the VPN world in 2 years with many more companies popping up all over the world. Although I haven’t done a review of VPN.ac recently I’ve been using them regularly over the past 2 years both personally and for test purposes and found them to be as good, if not better than they were 2 years ago. VPN.ac via their VPN service offer OpenVPN, L2TP/IPSec and PPTP protocols. A few different encryption modes are available when using OpenVPN which includes 256-bit, 128-bit, ECC and XOR. VPN.ac have a full and detailed explanation of the different encryption types and their purposes which can be accessed by visiting their website, clicking Support, Knowledgebase and then PPTP vs. L2TP vs. OpenVPN: which one to use? VPN.ac have custom software for Windows PC and Mac systems and an app for Android devices. iOS currently isn’t supported via a custom app so if an iOS app is a deal breaker then you’ll need to look elsewhere. If you’re happy to manually set-up iOS then VPN.ac provide guides on their website for OpenVPN and L2TP/PPTP set-ups and have other guides available for Linux and most major router systems. The Windows and Mac software are uniform both physically and in usability. This is great news if you plan to use the service on both systems because you can transition from one to the other without needing to understand a new interface. 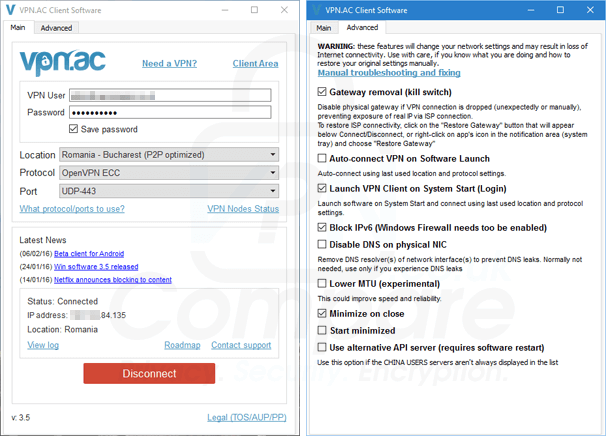 The VPN.ac desktop software is small and compact with one main window for entering your login credentials, selecting a server and protocol and making connection. The ease of use would make the software suitable for all experience levels. The software has a settings area named “Advanced” that allows users who know a little more about what they’re doing to enable and disable additional security features. Each option has a detailed explanation of what it does which I found extremely helpful. The Android app from VPN.ac has a similar layout to the desktop software which keeps things nice and simple. The main screen allows you to select your server, a protocol and port, enter your account details and connect. In essence, this means you can control everything from the initial screen. No fuss or mess here! Other menus are available including an Info menu that allows you to view your connection details such as IP, time connected and more. The setting section is pretty thin on the ground and basically covers various connection options. The VPN.ac Android app is limited to OpenVPN use only so if you need to make use of another VPN protocol then you would need to set that up manually. One of the smartest features that I haven’t seen before is “exclude apps” that allows you to select certain apps so they don’t make use of the VPN network. Of course everything you transfer over the VPN service is secure but if you have apps that need geographic access from your standard connection or you have apps that may throw up access issues from different locations like your banking, Paypal or finance apps then these can be excluded from using the VPN connection. The Android app is really simple to use with some interesting features and I enjoyed making use of it. VPN.ac used to be what I would class as a “small VPN provider” in terms of server locations and when I first reviewed them 2 years ago they only had 9 server locations. Over the past 2 years they’ve been expanding rapidly and now feature a massive 18 different VPN server locations. This takes VPN.ac to a medium sized provider and the added locations are certainly a welcome addition. Servers are available in the USA, Mexico, Canada, Australia, Finland, France, Germany, Italy, Luxembourg, Netherlands, Romania, Sweden, Spain, Switzerland, UK, Japan, Singapore and Hong Kong. VPN.ac don’t discriminate against what traffic you transfer over their network. This means you can use things like P2P on any of their servers. They do however specify certain servers that are optimised for P2P so it makes sense to use those. Chinese users are also well catered for with a separate server list in case the regular one gets blocked and specific servers aimed at helping Chinese users get around the great firewall of China. VPN.ac make use of Shared IP Addresses which means every user connected to the same VPN server node will be making use of the same IP Address. This is great news because it increases your privacy as other users traffic is mingled with your own. The servers from VPN.ac have a Smart DNS functionality built in meaning regardless of what country you connect to, you’ll still be able to access the major streaming services such as BBC iPlayer, Hulu, Sky Go and more. VPN.ac allow you to switch servers and connect and disconnect as many times as you wish. You’re also allowed to use the service on 6 devices concurrently which is a huge amount and more than most providers out there. The service makes use of their own encrypted DNS servers meaning DNS leaks are a thing of the past and you can be safe in the knowledge the URLs you visit are not logged by VPN.ac themselves or any third-party source. VPN.ac limit you to 2TB of data transfer per month but more is available on request. Most users won’t hit these limits but if you’re an extremely heavy downloader then you’ll need to speak with them to have these limits increased. Speed is one of the features that I heavily concentrate on when choosing a VPN service myself or when testing. Having a good service is all well and good but if the download speeds don’t live up to your expectations then you may as well do without. Using VPN.ac for my everyday internet habits has been a joy on both my desktop system and mobile device. I’ve had no problem connecting and forgetting about the service and browsing, video streaming and other bandwidth intensive tasks haven’t caused me any issues. To put the servers to the test I downloaded a 10GB test file on a selection of their servers on my Windows 10 system. Making use of their custom software using OpenVPN and 256-bit encryption plus the UDP protocol. All tests were carried out between 11:00 and 12 noon on Friday, 11th March 2016. Below are my speed test results. My connection speed without VPN at the time of testing was 209.57 Mbps. As the results show the selection of servers tested all provide adequate speeds and will be suitable for downloading, streaming in 4k from sites such as Netflix and a whole host of other uses. VPN.ac take encryption seriously. One of the main reasons they do such little publicity is due to concentration on providing a secure and robust network. A selection of encryption standards are available on the VPN.ac network. OpenVPN includes 256-bit AES-CBC, 128-bit AES-CBC or 128-bit BF-CBC. VPN.ac use a 4096 bit key for handshaking purposes which is at the top of the scale and Elliptic Curve (ECDHE) with secp256k1, SHA512 HMAC. L2TP/IPSec makes use of 256-bit AES or 128-bit AES depending on the device you’re connecting with. PPTP uses 128-bit MPPE but VPN.ac point out themselves that this method is insecure and should not be used for sensitive information. The policy areas from VPN.ac are rather refreshing. There are no bright lights or dazzle with VPN.ac and it appears they’re only interested in telling you like it is. What their service can do to protect your privacy and what it can’t. VPN.ac store connection logs but do not store your actual browsing or usage history. Connection logs are stored securely and deleted on a daily basis. The information contained within this log is your connection and disconnection time and your IP Address. VPN.ac state this information is stored to troubleshoot errors. Additionally these minimal logs are transferred away from the VPN servers themselves and stored in a fully encrypted undisclosed location. The policies from VPN.ac are quite in-depth but are written in clear and precise English. There are no red-flags but you should read through for your own knowledge before signing up. Support is available via a variety of different methods. The most common is their Support Form. VPN.ac also have a direct email address, Skype and XMPP/Jabber with OTR enabled as alternative methods of contact. VPN.ac are without a doubt one of my favourite VPN providers due to the service they deliver. In the two year period between now and my last review they’ve come on leaps and bounds with improvements and added server locations. In regard to price VPN.ac are competitive on a monthly basis but when taking a yearly package they become one of the cheapest providers available. For the monthly price on an annual package for the service they offer its outstanding value for money. The service is easy to access with custom software for Windows PC, Mac and Android. VPN.ac don’t currently offer a custom iOS app which lets the service down a little although there are informative guides to how to set-up on an iOS device. If having a custom iOS app is a deal breaker for you though you would need to look elsewhere. The software and apps are simple and easy to use. Functionality is comparable with other top providers and although they may not be aesthetically cutesy like other providers that are trying to appeal to a mass market their software does the job and is robust. VPN.ac now offer 18 different countries to connect to mainly concentrated in the US, Europe, Asia and the Australian regions. The expansion VPN.ac have made over the past 2 years opens the service up to the majority of users around the world. Servers are reliable and generally faster than some other providers out there. Using the service to access geo-restricted content, download torrents, stream video in high quality or just use for your everyday internet usage is more than possible with the VPN.ac service. VPN.ac offer top-end encryption and by reading through their policies you can really see they have a passion for offering a secure service that enables privacy to its highest possible level. While VPN.ac might not shout from the rooftops about their service it’s definitely one I’d recommend and as I use it myself on a regular basis it’s hard to fault. Get 20% off their service by using the coupon VPNCOMPARE20 and clicking the link below.